5 of the most essential knives you will ever need in your kitchen, an elegant knife storage block to house them all in, and an excellent-quality knife sharpening tool to help keep your knives in tip-top shape. All these could be yours, opening up a world of gourmet possibilities right in your very own home, taking food presentation to a whole new level. ''Did you hire a professional to do it,'' your friends would ask. 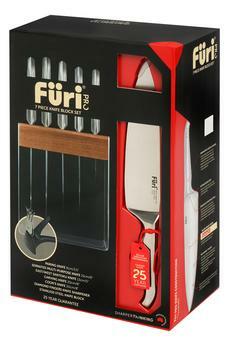 Nah, it's all you with a little bit of help from your Furi Pro Stainless Steel Knife Block set. The Furi Pro Stainless Steel Knife Block Set 7pc is built to perform, and designed to impress even the most experienced of chefs. The look and feel of it in your hand is just right, with its reverse-wedge handle that would give you superior control, balance, and comfort even when using it for long periods of time. The sharpness of the blade is long-lasting and easily maintained with the diamond fingers sharpener, to keep them razor sharp and ready all the time. Say goodbye to dull, mediocre knives, now you're ready for Furi Pro! Housed in an elegant no-nonsense storage block made of stainless steel and the exotic dark wood, Sapele. The knives are sharp. You can use the knives for long period of time before you have to sharpen them again.